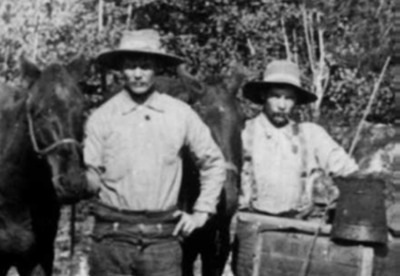 When a pair of prospectors named Thomas and Solomon Lovewell reached California in 1860, their journey marked a milestone in the westward migration of the Lovewell family, which had been going on for over two centuries. Lovewells must have arrived in America by 1658, which is when an 1861 transcription says "John Lowwell" married Elizabeth Silvester at Scituate. New England historian Ezra S. Stearns called this man "John Lowell the tanner,” to differentiate him from a cooper by that name, and pronounced him "the ancestor of the Lovewell family of Dunstable.” Researchers Michael J. Wood and John Blythe Dobson believe he was born around 1629 at Bristol, Gloucester, England, and died Jan. 7, 1694 at Boston. His son John, an early-day resident of Dunstable who apparently was never confused with John-the-cooper’s son, was consistently known as John Lovewell, long remembered as the man who first gave refuge to America's blood-drenched heroine Hannah Duston. Hannah Duston showed up at John Lovewell's door in 1697 with a bloody hatchet and ten Indian scalps. She had been abducted from her home at Haverhill during a raid by Abenakis a few weeks earlier. 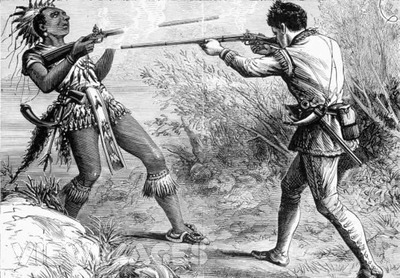 As she began a journey toward Canada as their prisoner with her newborn daughter in her nurse's arms, an Abenaki grabbed the baby and dashed her against a tree to stop the infant's incessant squalling. The death of little Martha Duston may have sealed Hannah's resolve to escape with two fellow captives, after committing a terrible act of vengeance as her new owners lay sleeping. 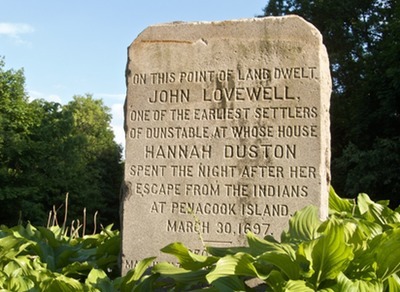 When Hannah was reunited with her husband and eight children at Haverhill, John Lovewell proudly hung a shingle in front of his house, which read simply, "Hannah Duston slept here." Decades before anyone had heard of Robert Rogers or Daniel Boone, John Lovewell's son, Captain John Lovewell, may have been the most famous Indian fighter in North America. In 1724, Captain John decided to put an end to the recurring raids that ravaged the English settlements near Dunstable. Raising a company of rangers, known as "snowshoe men," he took the fight to the enemy. After two successful forays into the northern frontier, his career and his life came to an end in May of 1725 when Abenakis ambushed his company at Saco Pond, later renamed Lovewell Pond. After "Lovewell's Fight," only about half of the captain's men found their way home again, but the Abenakis had also taken heavy casualties and were forced to make peace. Fortunately, Captain John Lovewell’s story did not quite end with “Lovewell’s Fight.” Eight months after his death his wife Hannah gave birth to their son Nehemiah, who would grow up to be a frontier scout and fight in the American Revolution alongside his own son Zaccheus. Zaccheus’s boy Moody Bedel Lovewell took up the family tradition, shouldering a musket in the War of 1812. He also fathered a dozen children who would fan out to settle the New West. Thomas, William, and Solomon Lovewell were pioneers in southern Iowa in the 1850’s, but seemed to stay only long enough to make their nest eggs by investing in Iowa farmland that was suddenly in high demand thanks to the Crimean War. Thomas would join an abolitionist colony in Marshall County, Kansas, for a few years before heading to Pikes Peak with his younger brothers Solomon and Alfred. As the brothers journeyed west on the eve of the Civil War, one of the most storied chapters in the history of the Lovewell family was about to begin.